WOOD CARVING TOOLS for Beginners to Advanced Carvers, Engravers, Model Makers, Toys, Miniatures, Doll House Furniture and Furniture Parts. Outstanding quality for long service and creative fun. Hardwood Handles are Stained and Lacquered and have Metal Ferrules. NOTE: Handle color may vary from colors pictured due to different manufacturing runs. 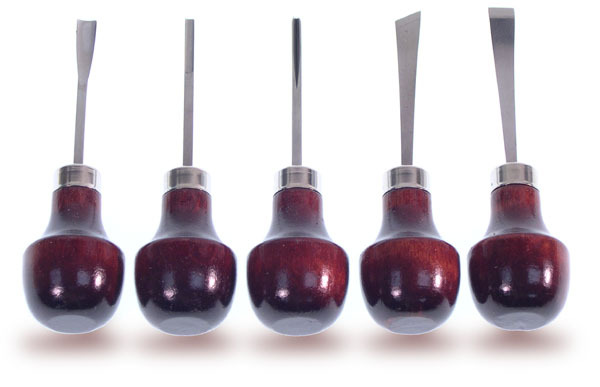 Handle color does not affect cutting edge quality and performance of chisels. 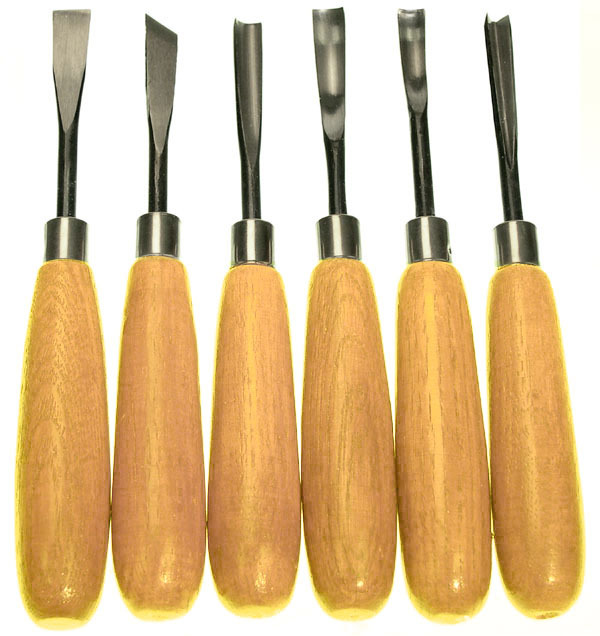 These Wood Carving Tools can also be used for Linoleum Block Carving. 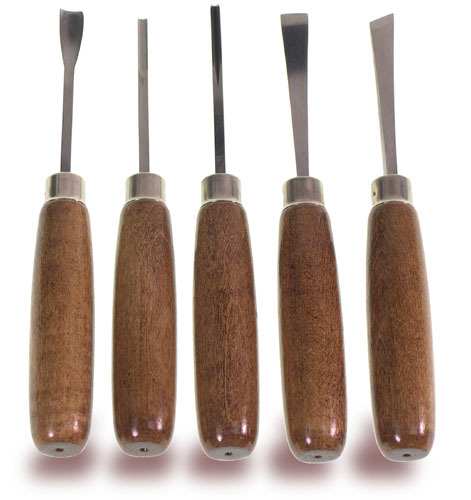 (B) Wood Carving Set, 5 Pc. SET w/Straight Handles. 5/8"W Bent Chisel, 5/8"W Bent Skew, 3/4"W Curved and 3/4"W Straight Gouge, 3/8"W and 9/16"W Bent Veiner. 2-3/8"L medium carbon steel blades. 5-3/4"L overall. 5 Pc. 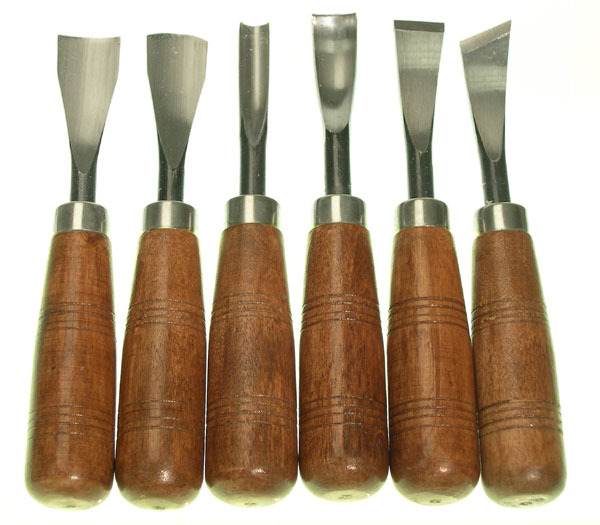 CARVING TOOL SET with Palm Handles. 5/16"W & 9/64"W Gouges, 9/64"W Bbent Parting, 3/8"W Skew and 3/8"W Bent Chisel. Made in U.S.A.
5 Piece WOOD CARVING TOOL SET with Straight Handles. 5/16W" & 9/64"W Gouges, 9/64"W Bent Parting, 3/8"W Skew and 3/8"W Bent Chisel. 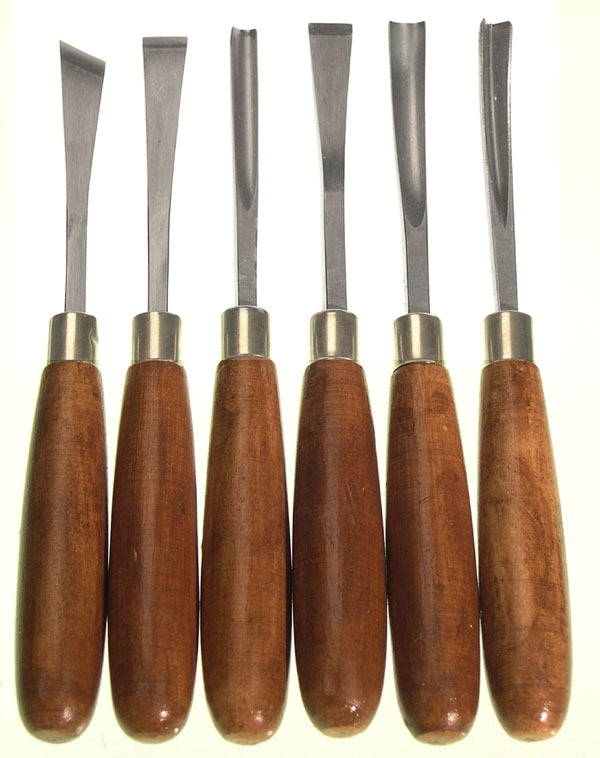 Made in U.S.A.
6 Piece WOOD CARVING TOOL SET Straight Handles. 3/8"W Chisel, 5/16"W Skew, 5/16"W Straight Gouge, 5/16"W & 1/4"W Bent Gouge and 5/16"W Parting. 2-3/8"l blades. 6-1/4"L overall. WOOD CARVING TOOL SET with Straight Handles. 7/16"W Chisel, 7/16"W Bent Chisel, 7/16"W Skew, 1/4"W Gouge, 3/8"W Bent Gouge and 5/16"w Bent Parting. 2-3/4"l medium carbon steel blades. 6-3/8"L overall. Imported.